This is a very wide chair and, in terms of the sitting position, quite low so, in some ways, it's an early version of the Halyard Chair from 1950 and, like the Halyard, the Tripartite Chair has a generous width for twisting and sitting at an angle. 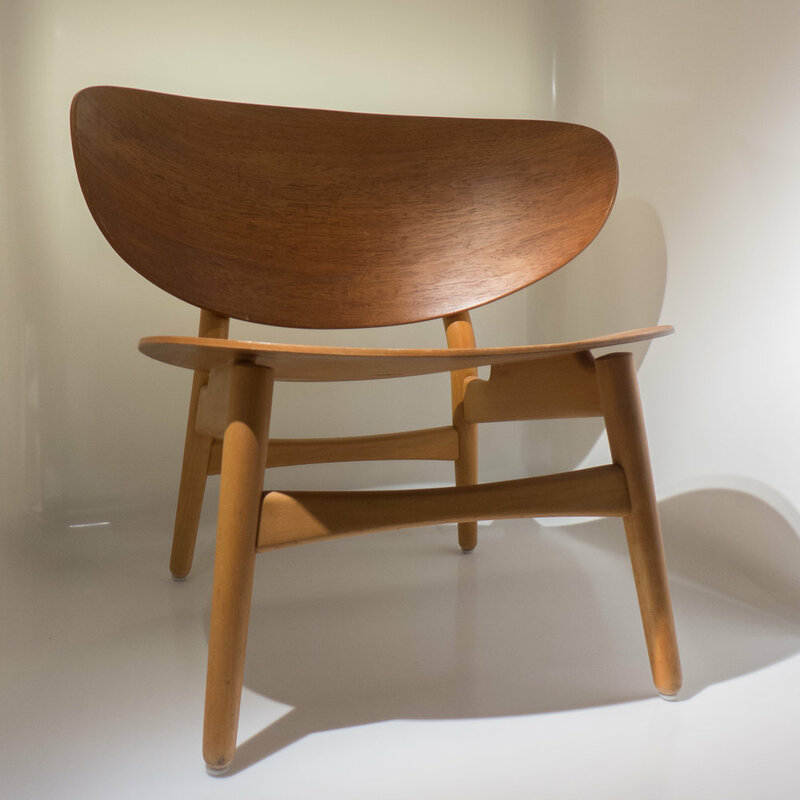 The seat, back rest and head rest of Wegner's tripartite chair are formed from relatively thick pieces of laminated wood that were shaped to form extended or flattened ovals and all three parts are curved but only across the width so only in a single plane. The head rest is the simplest and smallest part with the shape of an extended oval, padded and covered with leather and fixed directly across the upper parts of the two side frames. The largest of the three laminated parts support the back of the person in the chair and is shaped almost like the dish shape of a large military shield. The seat is wide with hand holds cut out on each side - either to help when you want to move the chair or possibly as grips to help when standing up. Neither the back nor the seat are fixed directly onto the side frames but are supported on small inverted cones so that the two main laminated parts are set parallel to the side frames but hover just above them. Large screws are counter-sunk into the front face of the plywood and go through the cone and down into the frame - for Wegner a slightly crude fixing showing the design was, to some extent, experimental and a first stage … the seat and back are normally covered with a sheep skin that adds to the comfort but also hides those screws. Viewed from the side the frame is almost like medieval window tracery and each side is made from two pieces of steamed and bent beech. The basic shape is rather like a lower-case letter h but with the upright leaning back and within that h a separate piece of beech bent like a lower-case n … within the h but not touching at all points. The inner part takes a tighter curve and the outer part swings wider before the two parts come back together at the lower ends … for the legs. 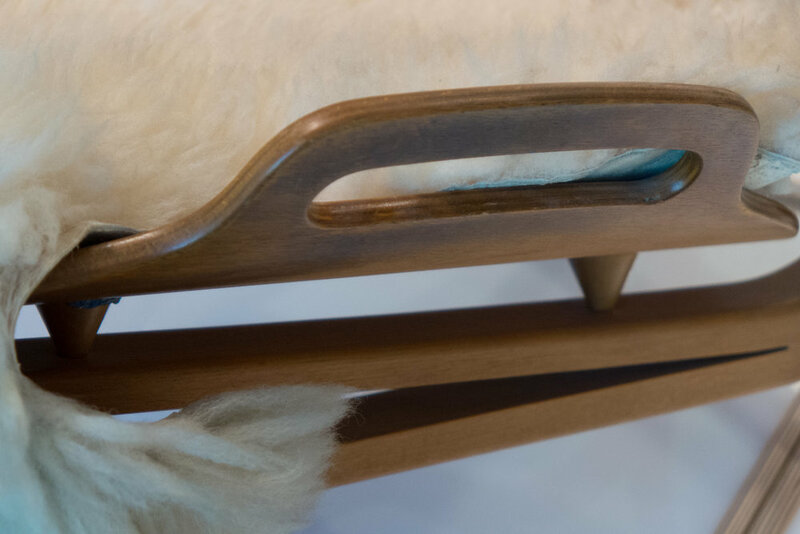 Wegner returned to this form of frame - that divides and then comes back together - in the Skalstol or two-part Shell Chair from 1963. At the top of each side frame are lugs, almost like serifs - to keep up the analogy with type face letters - that are an integral parts of the frame, cut from the same piece of wood, and they form the supports for the head rest. What is amazing is that below the top, the long pieces of wood are split up the middle and the back half, cut shorter, is bent down and out to form the outer part of the back leg and the longer part is curved up and runs under the seat and then is bent down to form the outer part of the front leg. 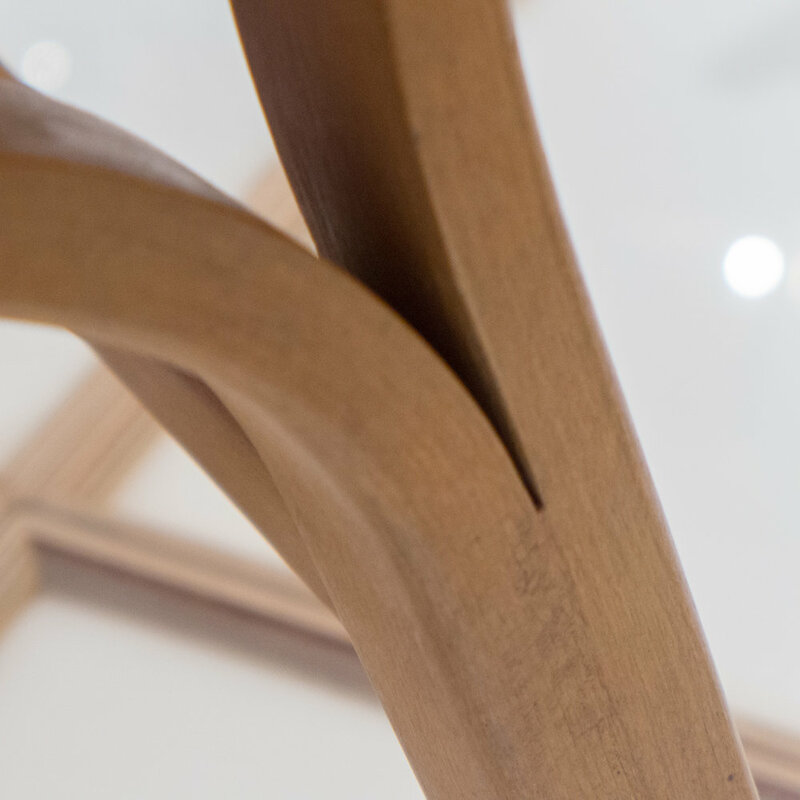 If viewed from above, the two side frames are not set parallel but are set to angle inwards towards the back and they are linked by cross bars at the front and back that are shaped so in profile they narrow towards the centre … like the cross bars Wegner used for Chair FH1936 in 1948 and for the Shell Chair he designed in 1963. If you compare the Wegner chair from 1948 (top) and the chair by Børge Mogensen from 1949 (below) with the sketch drawn by Wegner for the Tripartite Chair you can see strong similarities. All three chairs explore ideas about how to resolve problems with the construction - so how to fit the curved laminated parts to the frame. In all three chairs, the curves of the laminated parts sit on a solid, pyramid form of legs - a tapered and truncated pyramid - to give a strong base and a visually stable base. Being stable and looking stable are not always the same thing. For Wegner, in the design for the Tripartite Chair, there is a game between strong diagonal lines and curves. 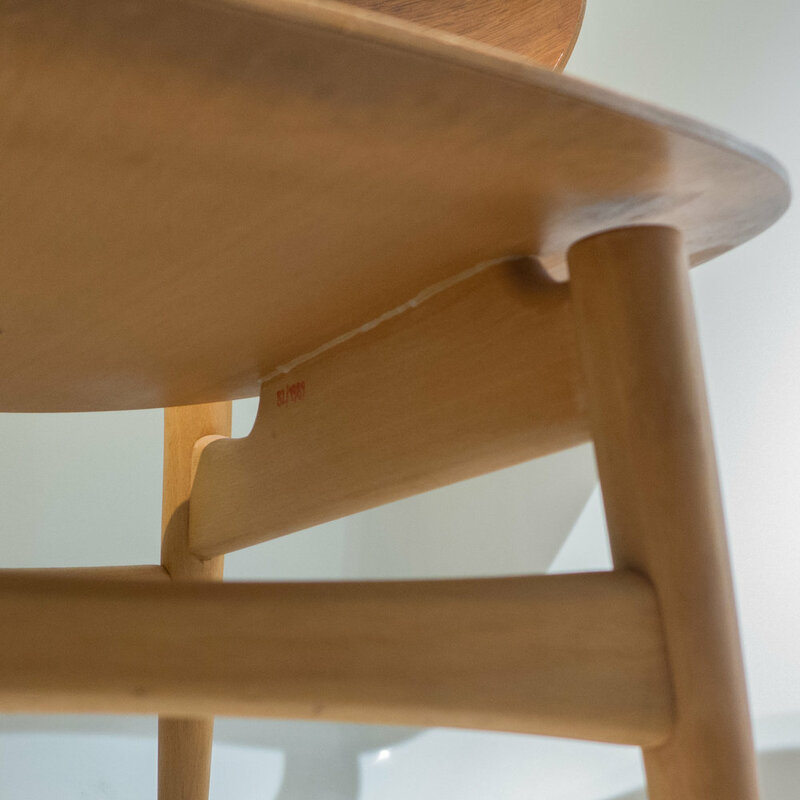 In 1948, Wegner, in the chair for Fritz Hansen, had used a form of tab, shaped like a spoke shave, cut from the same piece of wood as the cross rail, to support the seat and to fix it to the frame. That same detail is shown on the sketch for the Tripartite Chair with those tabs appearing to be fixed through slots in the seat, back and head rest but, at the work bench, that must have been impossible to reconcile with the process of bending the beech: cutting such an elaborate profile from a single length of timber and then steaming it and bending it around a former must have made the timber split. The solution was to use the cone-shaped spacers and fix the seat and back rest to the frame with screws down from the top, through the spacer and into the frame. If the Tripartite Shell Chair has a problem, in terms of comfort … I have not sat in the chair so it has to be an assumption … it would seem to be in the relationship of the angles at which the three parts are fixed. The seat is sloped down to be lower at the back - although hardly more than on many chairs - but the middle section supporting the spine of the sitter is at approximately 45 degrees to the ground so anyone in the chair is certainly laid back more than in most chairs, though not as far as in a recliner, but then the head rest is almost vertical … so it would seem that you sit back in the chair but with your head upright looking forward so potentially with your chin forced downwards towards your chest … and that is not a natural or a comfortable sitting position but might be one that would be easier if the head rest pivoted to adjust the angle. 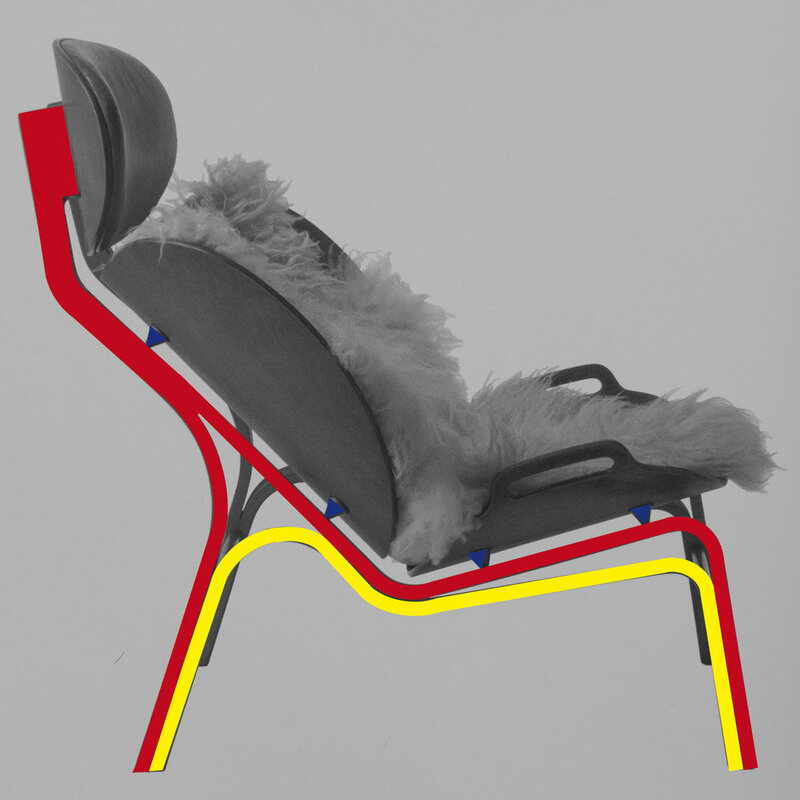 In fact, a design by Wegner for a metal-framed version of the tripartite chair - the sketch is published by Christian Holmsted Olesen on page 169 of his book Wegner - just one good chair - had one interesting detail shown on the sketch that suggests that Wegner appreciated that there was a problem with the version with a bent-wood frame but one that could be resolved in metal because the sketch of the metal-framed version has a head rest that appears to be pivoted along its central horizontal axis so that its angle would adjust if the sitter tipped their head to look forward or laid back in the chair looking slightly upwards. 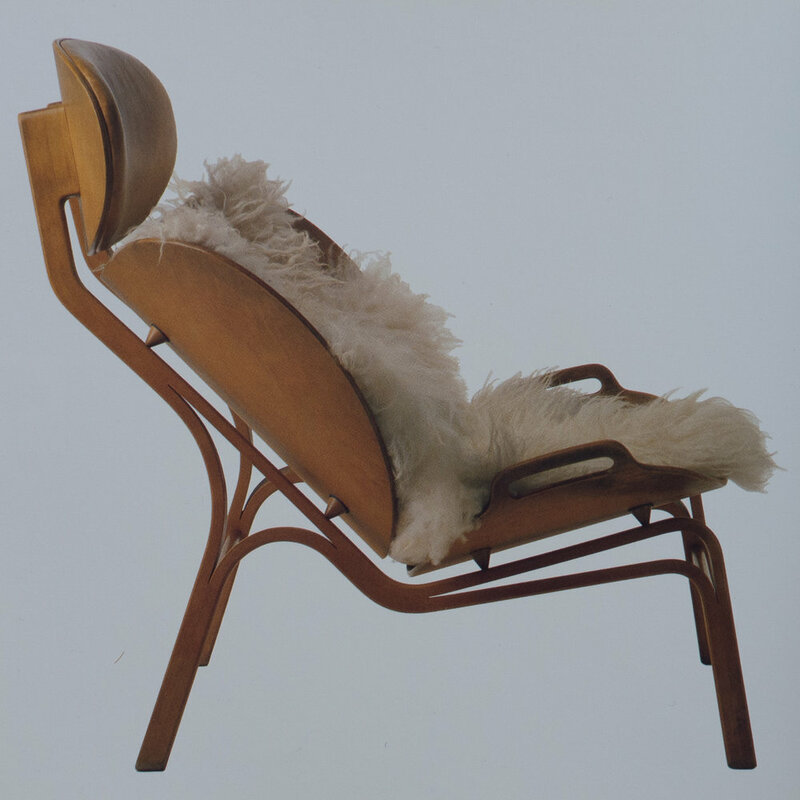 Perhaps the conclusion has to be that the tripartite chair was seen as a prototype - a chair to try out ideas that were modified in later and more-easily reproduced designs so the chair was showing off the skills of Wegner and Hansen but, like provocative or outrageous runway designs by a fashion house, with features and new techniques that were to reappear in more user-friendly or maker-friendly forms. 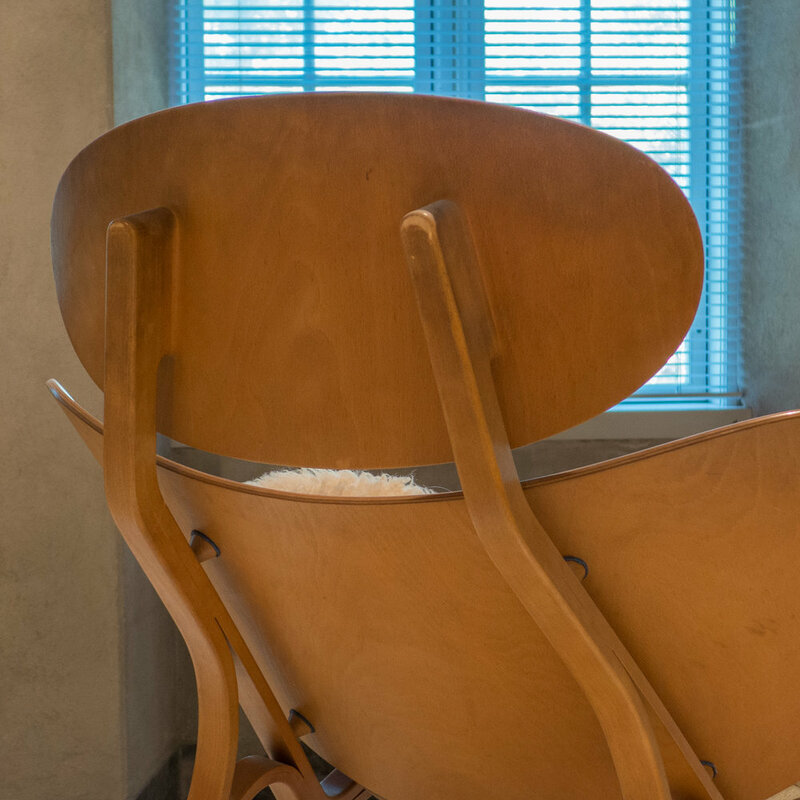 "The use of materials was clear and lucid, the fervour of the makers was evident in the craftsmanship, and the idea underlying the composition was clear and consistent." "There was a very large easy chair which differed markedly from the rest of the furniture as regards materials and construction. It was not quite convincing in the present version but it bore evidence of an unrestrained and almost Baroque delight in materials and forms and in the interplay between them." "Their large easy chair should be made in a factory to make the price somewhat less prohibitive - it certainly has great potential." 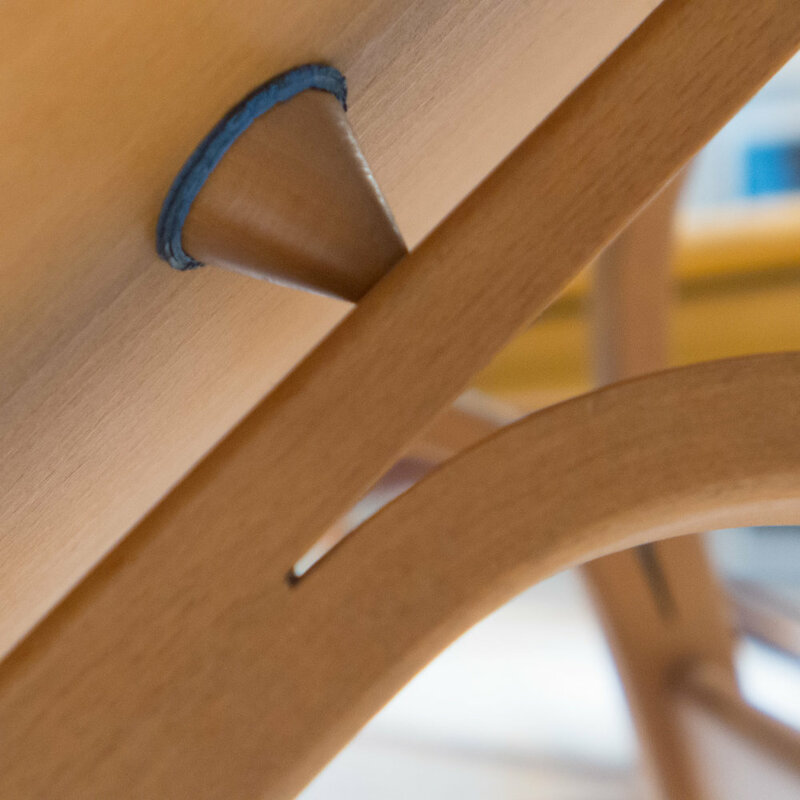 "It takes a skilled craftsman to make a chair like this, and perhaps the amount of work that has gone into it is getting dangerously close to the acceptable limit for a single piece of furniture. It must be remembered, however, that the exhibition pieces are models, just like the dresses made by the great Parisian fashion houses. They are an indication of the type of designs which will eventually be reproduced in less complicated versions ….. "